How many of you have your own personal moon man collection? Not too many, but Green Day does, maybe no real astronauts, but the little statues are just as cool. 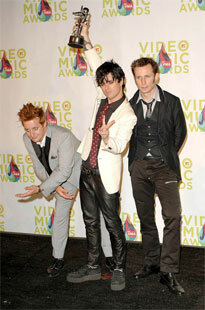 At the "wet and wild" themed 2005 Video Music Awards, Green Day swept Miami, Florida with a pyro-filled, action packed performance, and graciously accepted not one, not two, but seven Video Music awards, or moon men as they have been called. So what earned Green Day those shiny little statues? Well Boulevard of Broken Dreams got them Video of the Year, Best Rock Video, Best Group Video, Best Editing in a Video, and Best Cinematography in a Video. That’s five out of seven, so where do the other 2 nominations come in at? Sam Bayer and his amazing work with all the videos from American Idiot won Best Direction in a Video; after all, he used giant treadmills and had Tré Cool in drag, how much better can video direction get? One of the most respected and prized awards of the entire event is the Viewers Choice award. Fans all compete to make their favorite musicians win, and of course Green Day’s awesome fans prevailed and Green Day won the Viewers Choice award. The only award Green Day was nominated for they didn’t win was best art direction in a video, which went to Gwen Stefani. However, not all was so wonderful. Some people, jealous of other bands' success, decided to make some nasty comments from stage. Rolling Stone reported that Green Day was sitting behind G-Unit when Fat Joe insulted them while he was on stage. Billie Joe later stated that "It got a little scary for a second. I just pretended I didn’t know what was going on." The confusion strategy, good job Billie. Rolling Stone also featured a picture of Green Day with Billie Joe holding a moon man surrounded by Mike and Tré and a picture of Billie and Adrienne, saying Green Day was "deservedly the night’s big winners". "I think Rock dominated this year" is something Billie Joe can be quoted as saying, and through the success of American Idiot, not only at the VMA’s (try almost every award show across the globe), I think it’s safe to say rock very well did dominate.